The newly elected Democratic governors in California and New Mexico have decided to pull most National Guard troops from their deployment at the southern border. California Gov. Gavin Newsom announced Feb. 11 that he will withdraw 260 of the 360 troops who were sent to assist at the border last year by his predecessor, Jerry Brown, also a Democrat. “The border ‘emergency’ is nothing more than a manufactured crisis—and CA’s National Guard will not be part of this political theater,” Newsome said in a tweet. New Mexico Gov. Michelle Lujan Grisham made a similar announcement Feb. 5, withdrawing about 100 troops deployed by her predecessor, Susana Martinez, a Republican. “New Mexico will not take part in the president’s charade of border fear-mongering by misusing our diligent National Guard troops,” she said in a statement. Both Newsom’s and Grisham’s moves were mostly a statement—expressing opposition to President Donald Trump, who requested the deployment in April to help stem the tide of illegal border crossings. Since April, the situation has only escalated. Southern border apprehensions by Border Patrol are up by about 84 percent in the first four months of fiscal 2019, compared to the year before—the largest influx for this period in 12 years (pdf). Since his campaign, Trump has called the situation at the border a crisis, asking Congress to authorize construction of a wall on the border where security is inadequate. He pointed to drug smuggling, human trafficking, gang violence, and other crimes connected with illegal immigration and border trespassing, as well as the violence and other dangers faced by migrants who seek illegal entry. “Based on my extensive experience fighting transnational crime along the southern border, I know that we should absolutely finish building the wall, for the sake of the children,” he said in a Fox News op-ed. 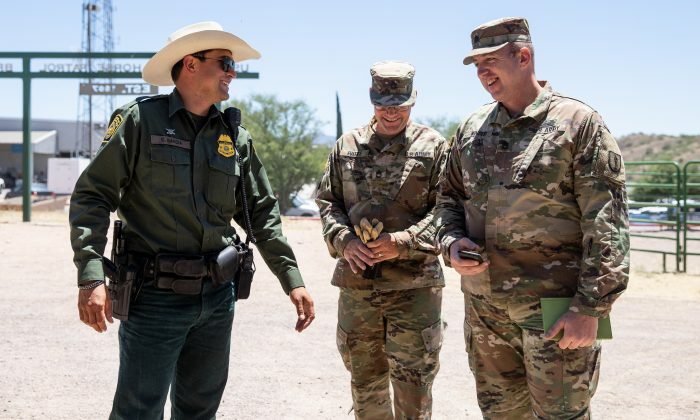 Some 2,100 National Guard members were on duty throughout the year along the border providing engineering, communications, vehicle, and logistical support. In addition, Trump had about 5,600 regular troops deployed to the border last year—2,400 in Texas, 1,800 in California, and 1,400 in Arizona. Most of them were withdrawn by the end of January. But on Feb. 3, the Pentagon announced that it will send troops to the border again—some 3,750—raising the deployment to about 4,350. The military will operate mobile surveillance cameras in Arizona, California, New Mexico, and Texas—a mission scheduled to run through Sept. 30. Some of the additional troops will also string up 150 more miles of concertina wire, the Pentagon stated. Trump demanded $5.7 billion to construct 234 miles of additional steel fencing along the 2,000-mile border in the 2019 budget, but Democrat lawmakers blocked the proposal. Trump refused to sign a bill without the wall money, forcing a partial government shutdown in December. After a record-breaking 35 days, Trump agreed to temporarily end the shutdown in exchange for a promise from lawmakers to negotiate on border security funding. The leading Republican negotiator, Sen. Richard Shelby (R-Ala.), said on Feb. 10 the talks had stalled over the weekend because the Democrats wanted to limit immigration authorities’ detention capacity. Even if Congress reaches a workable deal on the matter, it will likely give Trump much less than the $5.7 billion he wants for the wall. Officials have mentioned figures ranging from zero to $2.6 billion. If a deal can’t be reached, the partial shutdown will restart on Feb. 16. Trump’s acting chief of staff, Mick Mulvaney, said on Feb. 10 that the wall will get built with or without Congress appropriation, saying there are legal avenues for Trump to reallocate money from other parts of the federal budget for the wall, though some of those avenues only become available if Trump declares the situation at the border a national emergency. There are 31 active national emergencies already declared. If Trump does use the emergency powers for border construction, Democrats and left-leaning activists are likely to challenge the move in courts.